Wild Wednesdays -- Winter SleepersWednesday, February 1 at 3:30 pmFree for ONC members$2 children / $3 seniors / $4 adultsAll ages welcome!During the cold, snowy days of winter some animals choose to sleep the days away. Meet a few animals that spend their winter days and nights in the dark. Find out how they hibernate and take a trip to the Ogden Nature Center's own bear den. Meet in the Visitor Center. "Picture-Perfect Winter" Photo ContestEntry deadline: Thursday, February 2 at 4:30 pmAwards: Winners will be announced in the LS Peery Education Center at 1 pm, Saturday, February 4Entry fee: $3 per entry for ages 8-15, $5 per entry for ages 16 to adult Winter is a terrific time to capture the wonders of the Ogden Nature Center. So grab your camera (film or digital) and come out to shoot an entry for an Ogden Nature Center photo contest. 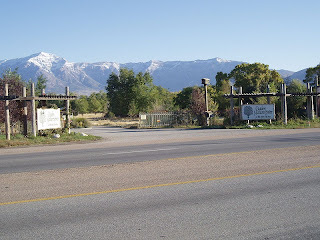 Requirements: Entries must be shot at the Ogden Nature Center during regular center hours between Jan. 2 & Jan. 31, 2012. No after-hours shots will be permitted. Entrants will be divided into two age groups: ages 16-adult and ages 8-15. Entrants can submit photos in two categories -- one entry per category:. Ogden Nature Center's resident animals including resident birds, reptiles & arachnids in cages and the Nature Center's three wild turkeys. General nature shots - includes the Nature Center's deer and all other wild critters, in addition to the landscape.Photos submitted for judging must be no larger than 8 x 10 inches and mounted on cardboard or foam board (no frames or glass, please), with entrant's full name, age, phone number, e-mail, street address and entry category on the back of the board. Earth-Friendly ValentinesSaturday, February 4 from 9-10:30Cost: $7 Members -- $8 NonmembersAges: 6+Create special Valentines using recycled and natural materials with local artist, Nancy Clark. All materials will be provided. Please call to pre-register at 801-621-7595 by Thursday, February 2. Class size is limited to 15 participants. Preschool Discovery Days - Motionless MarvelsChoose a date and time: Monday, February 6 at 9:30 am, 11:00 am or 1:00 pmTuesday, February 7 at 9:30 am, 11:00 am or 1:00 pmCost: $4 child/adult pair - members$4 per child for preschool groups of 5 or more students, teachers/aides are free with class$5 child/adult pair - nonmembersAges: 3-5From towering trees to tiny rocks, many of nature's wonders hardly move at all. Sing songs and hear stories, play games and learn through hands-on discovery what makes nature so marvelous. General admission fees apply to any additional family members in attendance. A non-refundable deposit of 50% must be paid in advance to pre-register groups of 5 children or more. Pre-registration is required as classes fill up quickly. Please call 801-621-7595 to register. Wild Wednesdays -- Wild Romance: A Valentines Day SpecialWednesday, February 8 at 3:30 pmFree for ONC members$2 children / $3 seniors / $4 adultsAll ages welcome!Have you ever wondered if animals flirt with one another? Meet some of the Ogden Nature Center's resident birds and reptiles and discover the unique ways these animals attract a partner. Then make your very own nature-themed Valentine. Please meet in the Visitor Center. Nature is for Lovers Saturday, February 11 from 7 - 9 pmCost: $30 per coupleAges: 21+Come to the Ogden Nature Center for an evening of wine and desserts and learn about love wildlife style! Play a fun couples guessing game about animal and plant mating rituals, meet one of February's feathered lovers and take an optional romantic night walk around the Center trails. Space is limited and pre-registration is required to 801-621-7595. Please rsvp by 4 pm on Friday, February 10. Wild Wednesdays -- Owl TalesWednesday, February 15 at 3:30 pmFree for ONC members$2 children / $3 seniors / $4 adultsAll ages welcome!Are owls really wise? Get the answer to that question and many others as we meet three different owls and decode the mysteries that surround these amazing birds. Please meet in the Visitor Center. Join the Great Backyard Bird CountFriday, February 17 - Monday, February 20, 2012In your own backyardCount for fun. Count for the future! Bird and nature fans throughout North American are invited to join tens of thousands of everyday bird watchers for the 12th Annual Great Backyard Bird Count. Participants count birds and report their sightings online. Visit www.birdsource.org/gbbc/ <http://www.birdsource.org/gbbc/> for details. Scout SaturdaysSaturday, February 189 am - Native vs. Invasive10 am - Conservation11 am - Venomous ReptilesCost: $5 per scoutThe Ogden Nature Center provides the perfect outdoor classroom for scout activities. A teacher/naturalists will help scouts pass off badge requirements during these 45-minute workshops. Reservations and a non-refundable deposit required. Please call 801-621-7595. For more information on the requirements in each badge refer to our website at www.ogdennaturecenter.org/education/scouting-programs . Wasatch Audubon Society February PresentationTuesday, February 21 at 7 pmFreeDr. Steve Clark, Weber State University professor, will present Reconnecting With Your Wildness - Adventures With An Etho-Botantist. Dr. Clark will speak about world-wide experiences with people/plant relationships. Meet in the Visitor Center. Wild Wednesdays -- Accipiters: Aces of the ForestWednesday, February 22 at 3:30 pmFree for ONC members$2 children / $3 seniors / $4 adultsAll ages welcome!Sharpies! Coops! Goshawks! Utah is home to these three types of accipiters, also known as the true hawks. Meet the Ogden Nature Center's own goshawk and discover how accipiters survive in forests. Meet in the Visitor Center. Growing Up Wild Teacher WorkshopWednesday, February 22 from 4 - 8 pmCost: $40 -- this workshop provides 2 resource guidesThis workshop will introduce educators to Project Learning Tree and Project WILD's Early Childhood Guide which integrates nature-based exploration, art, literature, math, music and movement, and outdoor play into early childhood education programs. The guides contain activities that encourage young children to explore the senses, the seasons and neighborhood trees. The activities highlight the importance of kinetic learning and engagement by incorporating music and movement using an accompanying music CD. Eligible for four re-licensure points. To register visit https://usee.ejoinme.org/MyPages/PLTWETWILDWorkshops/tabid/277857/Default.aspx Handmade Journals with Adele GreenleafTuesday, February 28 at 6 pmCost: $30 members / $35 non-members -- includes materialsAges: 14+Create a simple yet sophisticated journal with a beautifully sewn binding. Perfect for field, garden or travel notes. Please pre-register by Wednesday, February 22 to 801-621-7595.